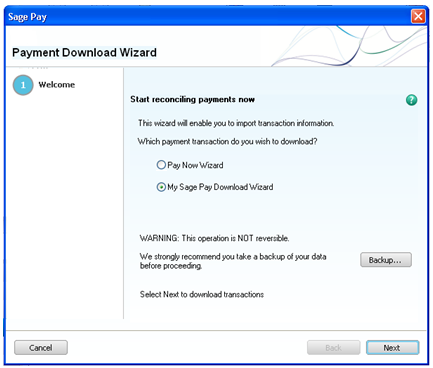 Now that you have linked your Sage Accounts software with your Sage Pay account you are able to use the MySagePay download wizard to import your transactions into your Sage Accounts software. 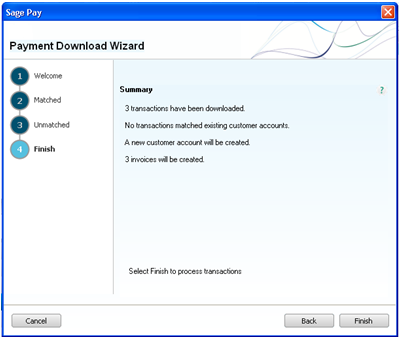 If selected when setting up the integration with Sage Pay your MySagePay download wizard will be launched when you sign into your accounts software. 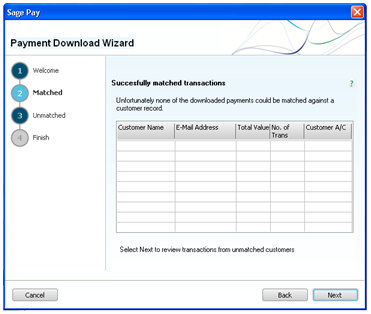 After selecting the MySagePay download wizard you will be able to proceed to the next step. 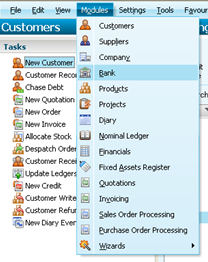 You will be shown all transactions that have been located on your sage pay account along with the details, and date of the payment that have matched current customer records on your account. Your accounts software will compare all of the transactions that have been downloaded to the current customer records by using the e-mail addresses that were used for the transactions. If there are no existing customers on your accounts software with the same e-mail addresses as those used for the transactions there will be no transactions appearing here. After proceeding through the matched transactions step you will move onto the unmatched page. 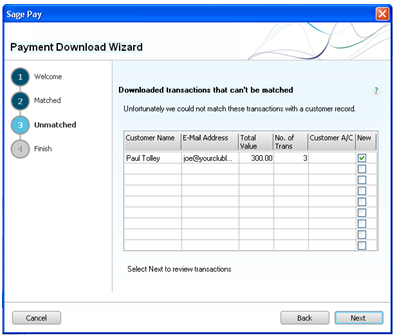 This page will show all transactions that have been located that do not match with the current customer records you have on your accounts software. You will then be able to select if you would like a customer record to be created for the transactions that do not match records on your system. On this screen your software will summarise the actions that will be taken for you. You will be told how many transactions were located, and downloaded. How many match current records, how many new customer records need to be created, and how many invoices will be created.